US couples spend an average of $20,000 on their weddings. Decorations are usually around 8% of the total wedding cost, averaging about $1,600. But wedding beach decorations can be less expensive if you plan well. Continue reading and you will learn how. 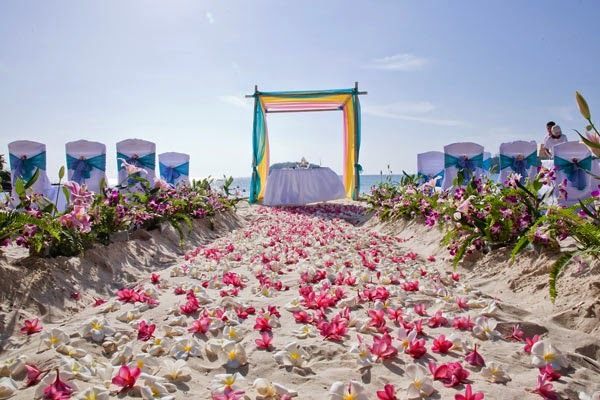 Finding decorations for your beach ceremony is a no-brainer, right? Maybe if you are a creative genius. For the rest of us things can be a bit more complicated. Follow these simple tips for creating chic, hassle-free beach decorations for your wedding. Casual, barefoot beach weddings don't need flooring. But if your wedding will be more formal, flooring is a must. Why? Without flooring on the beach, sand will get into peoples' shoes, clothing will become wet, torn or soiled, and guests may have a hard time walking in the sand. If anyone attending is elderly or infirm they should have chairs. Without flooring the chairs can easily sink into the sand or tip over. Many rental supply companies offer flooring for rent. The average cost is $3.50 - 4.00 per square foot including set up. There are as many styles of wedding arches as there are brides who want beach weddings. Renting an arch is easy but it can be cheaper to build your own. Start with a metal or wood arch you buy at a hobby shop or building supply store. Then decorate it however you like. Tropically-themed arches: Making a tropical arch is easy. Wrap the metal or wood arch with palm fronds or banana leaves. Then add a strong splash of color by adding tropical flowers such as birds-of-paradise, antherium or heliconia. Finish by suspending a starfish or sea shell from the apex. Chuppah Arch: Traditionally used in Jewish weddings, this is a cloth or sheet canopy supported by four poles. 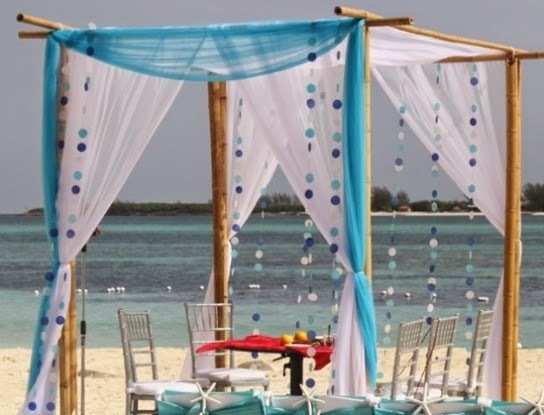 A chuppah makes the ceremony more intimate and provides shade on the wedding beach for the happy couple. To make a chuppah more stylish, use shorter poles and ask four members of your wedding party to each hold one of the poles during the ceremony. 1. Use local flowers along the aisle. If chairs are on both sides, just suspend flowers from the chair backs and arms. 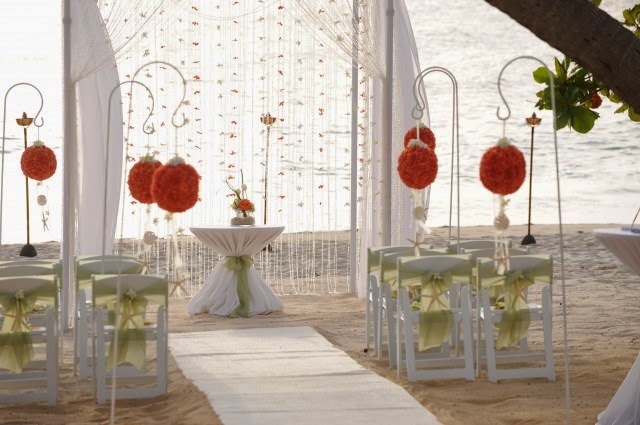 If there aren't any chairs, create an aisle with palm fronds or banana leaves on the sand. Add some color by layering hibiscus, protea or other local flowers on top of the leaves. 2. Beautify your decorations by adding some torches. Tiki torches perfectly coordinate wedding beach decorations. Two rows of torches can create a natural aisle if you place them four feet apart. If you already have an aisle, then place the torches at random and light them to provide a tropical aura. The effect is even better if you have a twilight ceremony. 3. Ribbons are another spot-on accompaniment for beach weddings. Ribbons, fluttering and waving in the ocean breeze, are just the thing for setting off your celebration. Use pastel colors in pink, blue and coral. Make sure ribbons are well-secured so they don't blow away. 4. Harmonize with the beach vibe by scattering starfish, shells, coconuts and palm fronds abundantly. Just be careful not to place any sharp items where guests may accidentally hurt themselves by stepping on them. 5. Boat oars, anchors and fishing net are also perfect elements for unifying your beach wedding theme. Borrow these from friends or nearby residents along the beach. Rent expensive items instead of buying them. It's more sensible to rent expensive flooring, tables, chairs and other large items. If you do purchase them, buy them on sale at warehouse clubs and hobby shops. Don't buy anything at full price. Instead of buying or renting smaller decorations, borrow from family and friends. Someone you know probably has an arch, extra ribbon or sea shells they would be happy for you to use in your ceremony. Make a list of what you need and ask around. Make your own decorations, or at least some of them. Bows, ribbons, signs and similar items are easy to make and subtract from your decorating cost. Whenever you can, use locally grown flowers. They are normally less expensive than flowers which are grown somewhere else and then shipped in. Also keep in mind that flowers have a short shelf life. If they aren't sold within several days they must be thrown out. This means you can ask local florists for special deals on flowers they need to sell quickly. Keep your wedding decorations simple. Your surroundings are the decorations when your ceremony is on a beach. 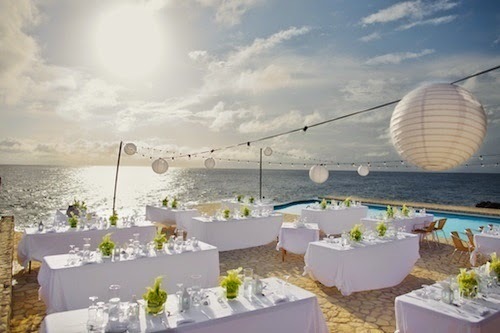 With just a few tasteful additions your wedding beach decorations will be complete.